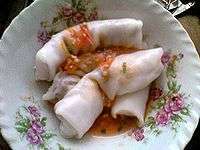 Bánh cuốn (literally "Rolled cake") is a dish from Northern Vietnam. Bánh cuốn is made from a thin, wide sheet of steamed fermented rice batter filled with a mixture of cooked seasoned ground pork, minced wood ear mushroom, and minced shallots. Sides for this dish usually consist of chả lụa (Vietnamese pork sausage), sliced cucumber, and bean sprouts, with the dipping sauce which is fish sauce called nước chấm. Sometimes, a drop of cà cuống, which is the essence of a giant water bug, Lethocerus indicus, is added to the nước chấm for extra flavor, although this ingredient is scarce and quite expensive. The rice sheet in bánh cuốn is extremely thin and delicate. It is made by steaming a slightly fermented rice batter on a cloth that is stretched over a pot of boiling water. 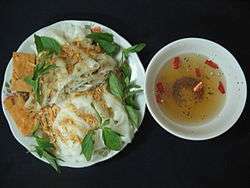 It is a light dish, and is generally eaten for breakfast everywhere in Vietnam. A different version of bánh cuốn, called bánh cuốn Thanh Trì and bánh cuốn làng Kênh, may be found in Thanh Trì, a southern district of Hanoi and Kênh village of Nam Định, an ancient village in the centre of Nam Định city.Bánh cuốn Thanh Trì or Bánh cuốn làng Kênh are not rolls, but just rice sheets eaten with chả lụa, fried shallots, or prawns. This type of rice noodle roll is known in Thai cuisine as khao phan (Thai: ข้าวพันผัก; lit. "rice wrap"). It is regarded a speciality of Uttaradit province where it is eaten freshly made in many variations, but also sun-dried. The dried versions often have spices added to them and are popularly used as a wrap for a spicy salad made with rice noodle and minced pork. Khao phan is not easily found in the rest of Thailand. Wikimedia Commons has media related to Bánh cuốn.